Gutter cleaning and gutter maintenance are an important part of home ownership. Your gutters are the collection system, on the edge of your roof. They are designed to divert water that is running off your roof to downspouts. Without gutters, the water would run off your roof in curtains. Unfortunately, your gutters also collect debris like leaves, twigs, and dirt. If too much of that debris collects in your gutters, there is nowhere for the water to go and gutter cleaning becomes necessary. Gutter cleaning is not a pleasant chore, but it is something that every homeowner has to do for many reasons. This site, will give you gutter cleaning tips and suggestions about gutter cleaning tools. This information could mean the difference between a beautiful home and a disaster. Although gutter cleaning is a chore, if you do not complete it you could end up with far worse problems. Gutters are the first line of defense against erosion of soil around your home foundation. A gutter system is supposed to carry water running off your roof to down spouts so it does not saturate the soil next to your house. If this soil is saturated, then you run the risk of getting the foundation wet. 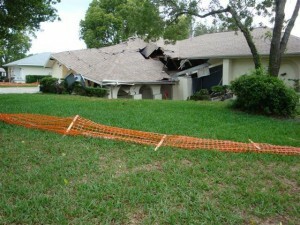 A foundation exposed to water can lead to a multitude of problems. When water comes across a barrier, it will look for the path of least resistance to continue. If that barrier is your foundation, water can find its way into small cracks in the foundation. No concrete foundation is going to be perfect and crack free. As water travels into the cracks, it will find another barrier because the cracks do not go all the way through the foundation. Therefore, the water will turn around and flow out of the crack, but it will take small pieces of concrete foundation with it. Every time water overflows your gutters and finds its way into the foundation, it erodes away at it. After enough time has passed, the cracks will work all the way through the foundation and water will leak into your basement. Water in your basement can lead to problems with mold, mildew, and other bacteria. If your gutters are not cleaned regularly and they start to overflow, allowing water to find its way to the soil directly next to your house can also be a problem. As the soil on top becomes water logged, the water will travel deeper and deeper into the soil layers. If the soil underneath your foundation becomes too saturated then it could give way causing a cave in of your home’s foundation. In other words, your house would collapse into a giant sinkhole and could be unlivable. The picture below gives you can idea of what could happen if your gutters are not properly cleaned and maintained. 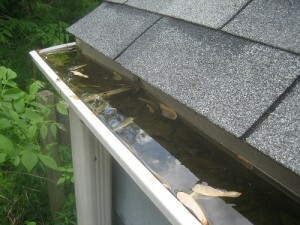 If your gutters are clogged that means that they are heavy. Too heavy, in fact. The fasteners that are used to attach your gutters to your home cannot withstand the weight of a gutter system full of wet leaves and debris. When your gutters are too full they start to pull away from your house. If they are not in position to catch rainwater running off the roof, the problems to your foundation and possible sinkholes are even more of a concern. Not to mention that a gutter that has pulled away from the house in an eye sore and the falling gutters could get in the way of your security solar lights. Your house will look very unattractive and not well taken care of. If you are thinking of selling your home, gutters that are sagging or out of position could be a deal breaker. How Do I Clean My Gutters? Fortunately, the actual process of cleaning out your gutters is not a difficult one. It may be time consuming and unpleasant, but not hard. The tools you need to clean gutters are things that you probably already have around the house. Even though there is specialized gutter cleaning equipment out there, it is not necessary to do an adequate job at gutter and downspout cleaning. The first thing you will need to do gutter cleaning is a ladder. You need to be able to reach the gutters safely. Make sure that you are using a sturdy ladder and leaning it up against a solid surface. Never lean the ladder against the aluminum and relatively unstable gutter system. The aluminum gutters will buckle under the weight of a person climbing on a ladder. When you climb up the ladder, you will only be able to clean the gutter sections that you can reach. Therefore, you will have to keep climbing down and moving the ladder after you clean each section. An alternative that might make the gutter cleaning go faster is a scaffolding system. Scaffolding is a modular system of pieces made of metal that support people when they are working up in the air. Metal is the most common material of construction, but you can find scaffolding systems made of other materials or a combination of wood and metal. While you will be able to reach more of the gutter system before having to move the scaffolding, there is a downside in that it takes time to construct the scaffolding. Once you can reach your gutters for cleaning, you will need some kind of gutter cleaning tools to clean out the debris. The cheapest way to clean your gutters is with a pair of work gloves. What? You cannot use gloves to clean gutters. Well, I should say that you need to put your hands in the gloves. That’s right, your hands are an effective gutter scoop. You definitely need a pair of gloves, though. You do not want to be touching the moldy leaves and possible bacteria that have contaminated your gutters. The one problem that you might run into with your hands in a pair of gloves is that your progress will be slow. You can only pick up so much debris at a time with the hand. An alternative to using your hands is using a gutter scoop. You can buy tools made specifically for cleaning out gutters. They are scoops with high sides to allow for maximum capacity and thin enough to fit into your gutter system. Make sure you measure your gutters before purchasing a gutter scoop because they come in many sizes. Not only will you be able to pick up more debris at a time with the scoop for gutter cleaning, but your reach will be extended. There are long handle gutter cleaning tools that allow you to increase your reach up to two feet in both directions. A long handle and high capacity will make the gutter cleaning process go much faster. As you are scooping out all of the dirty leaves, twigs, and other debris that clog your gutters, where do you put it. There are two choices. First, you could just throw it on the ground as you go. Then, you can walk around your house picking up the debris later. Or, you could take a garbage bag with you when you go up the ladder. That way, you can throw away the debris as you go. There are advantages to both methods. Not having a garbage bag with you on the ladder allows you to work with both hands more easily. You will be able to clear debris much faster. On the other hand, walking around your house later to pick up the debris on the ground, will just add time to the chore anyway. Once you scoop out all of the large pieces of debris, you might find that there is a residue on the sides and bottom of your gutters left behind. A slimy layer of mold or mildew could be coating your gutters. While this may not obstruct the flow of water, it will give off an unpleasant odor. It is important to clean this residue out as well. For that, you should use gutter cleaning brushes. Of course, there are brushes marketed specifically for this purpose, but any brush that will fit into your gutters will get the job done. Gutter cleaning brushes with longer handles and a round head are best so that you can reach as far as possible without moving your ladder or scaffolding and so that you can scrub in all directions without having to move the position of the brush in your hand. Once you have cleared away the large debris and scrubbed the inside of your gutters to get rid of any residues, you will need to rinse. The easiest way to accomplish this task is with a garden hose. Just turn on the garden hose at one end of your gutter system and let the water rinse as it travels throughout. When it completes the rinsing trip, it will run out the downspouts and you will be done. If you want to skip all the steps that require you to scoop and scrub debris, then you might want to look into using a pressure washer. Pressure washer and gutter cleaning will go together if your clogs are not too severe. You can turn the pressure washer on and spray the high powered stream into one end of the gutter system. The high pressure should be able to loosen any small clogs and carry any debris either over the sides of the gutter or to the downspouts. One problem with this approach is that it could create a big mess. As the high pressure water stream goes into the gutter system, it might spray up over the sides carrying debris and mold down the side of your home. Also, most pressure washers do not have a very long hose or handle so you will have to find a way to bring the pressure washer up to the level of your gutters. If you do not want to wrestle with heavy machinery on a ladder or scaffolding system, then you might look into a gutter cleaning wand. Gutter cleaning wands operate under the same principle as the pressure washing technique, but they are made especially for gutter cleaning. They usually have an extremely long handle so that you can stand on the ground and reach up into your gutters. They spray water under pressure into your gutters in a controlled manner so that there is not too much spill over. One final alternative is to use a gutter cleaning robot. There are devices out there that are designed to move along your gutter system and clean as they go. 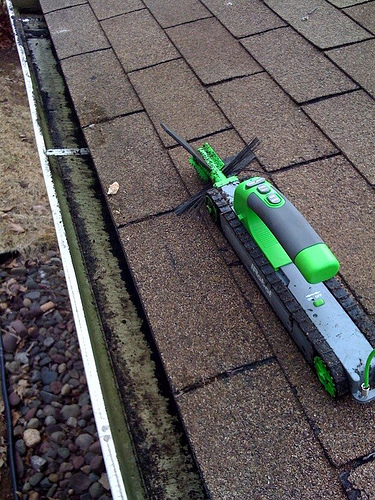 Companies like Looj or iRobot make small machines that will fit into the gutters and have brushes on the front that scrub your gutters clean. I would not recommend using a machine like this if you have significant clogs because they could stall the gutter cleaning machine. Cleaning your home gutters can be a dangerous job. There are a few safety considerations that every home owner must think about. Perhaps the most obvious, is ladder safety. There are literally thousands of ladder industries every year according to the Consumer Product Safety Commission. There are even some deaths associated with homeowners not using their ladders correctly or choosing the worn ladder for a particular purpose. The most important ladder safety tip is that the base of the ladder much be on solid, level ground. Make sure there is no ice, snow, grease, or mud beneath the feet of the ladder. All of these conditions could cause the bottom to skip out from under you when you are on the ladder. Another important thing to do correctly is to place the ladder in the right position. A good general rule is that for every four feet high that the ladder is going, the base should be one foot away from the side of the house. Another important safety tip is to always face forward when moving up and down on the ladder and never take both hands off the ladder. The video above will give you more ladder safety information. Another important safety tip for gutter cleaning is to always wear gloves. The moist environment of your clogged gutters is the perfect place for mold and bacteria to grow. You want to expose yourself to as little of these potentially harmful materials as possible. Most people, if wearing gloves will come away with nothing worse than a few sneezes. However, if you have a severe mold allergy, you might not want to clean your gutters yourself. It might be better for your health to hire a professional gutter cleaning service. Unfortunately, for our gutters, most people wait to clean them until there is a problem. The truth is that your gutters should be cleaned twice a year. You should complete this project in early spring to clear out any left over ice and debris that has accumulated during the winter. You should also go through cleaning your gutters in late fall. This is perhaps the most important time of year to clean your gutters because you need to clear out all the falling leaves and things that gather in your gutter system during fall before the melting snows of winter begin to tax your gutters and downspouts. Complete a gutter cleaning project twice a year may seem like overkill, but if you clean them regularly the task should not be too involved any one time. But still, it sounds like a lot of work. You may be wondering if it would be better to hire a professional gutter cleaning service to do the job. In terms of gutter cleaning cost, it is cheaper to do the work yourself. You only need a few household items and the only real expense is your time. But, that extra time with your children or spouse might be worth it to you. Gutter cleaning services can charge a wide range of gutter cleaning prices. Factors like the size of your house, how many stories your home is, how clogged the gutters are, and whether the downspouts are clear can all effect the price. You might pay anywhere from seventy five dollars to five hundred dollars. It is a good idea to only hire the services of someone who will give you an estimate. If someone claims to give a one price fits all service, chances are that they might not do excellent work. There is a touchy-feely reason that you might want to clean your own gutters. There is a certain amount of pride that goes into taking care of your own home. When you make a purchase as large as a home, you want to do everything you can to keep that home looking great and in top condition. When you complete a household chore like cleaning your gutters, you feel like you are contributing to the well being of your home and your sense of ownership and pride becomes stronger. The bond between homeowner and home is an important one. If you hire gutter cleaning services, the cleaning is usually only part of the service. Gutter professionals will also make sure your gutters are attached firmly to your home so there is no separation. Gutters are typically attached to the home with special hangers and the gutter cleaning service will replace them if necessary. They will also level your gutter system so that they are at the proper angles to maximize efficiency. Some gutter professionals actually do gutter cleaning as a side business. For example, some roofing service companies offer gutter cleaning services so a benefit to hiring gutter cleaning professionals is that you can get other necessary home maintenance done at the same time. All in all there are pros and cons of both doing the gutter cleaning yourself and hiring a gutter cleaning professional. I solve this problem by hiring a service once every two years. The other three cleanings I do myself. When the professionals come, they take care of the gutter science, and I just make sure that the clogs do not get too bad in the mean time. If you want to avoid cleaning your gutters as much as possible, then you may want to make the investment into a gutter guard system. Gutter guard systems vary in method, price, and effectiveness. Finding the right gutter guard for your gutters depends on your local weather, foliage, and the pitch of your roof. Essentially, a gutter protection system will allow the water to flow into the gutters, but not the debris that typically clogs them. There are two main types of gutter guards. One is a screen of some kind with holes big enough to let water in but small enough to keep leaves out. These systems will still let in some debris, so you will need to clean your gutters; just not as frequently. The price on this type of gutter protection can range from $250 for a do it yourself project to over $2,000 for a professionally installed option. One popular gutter guard manufacturer is called Amerimax. Hey make a wide variety of gutter systems and gutter protection options. The other main type of gutter guard works on the principle of water adhesion. A flap of sorts extends from the edge of the roof over the gutters to the edge of the gutter system. As water and debris are running off your roof, the water adheres to the flap just long enough to let the debris fall away over the side of the house and the water to fall into the gutters. This type of gutter guard system can be very expensive. These products cost between eighteen and twenty dollars per foot. An average 1,500 square foot has about 160 linear feet of roof line. That translates into anywhere from $2,880 to $3,200. Nevertheless, most people who have this type of gutter protection think it is well worth it because they practically never have to clean their gutters. No matter what kind of home you own, a mansion or a cottage, gutter cleaning is an important household chore that cannot be ignored. Make sure that you take care of this task so that your home lasts as long as you do. ← Are Gutter Scoops Worth It?